In this four-part series, we have been charting a course for teachers working in classrooms with tablets. We began by looking at the consumption of content -- the default uses of tablets -- and then progresses through the the curation of learning artifacts, and the creation of new projects or activities. In this final piece, we examine the final of our four Cs: connection -- using tablets to put our students in conversations with fellow learners of all ages around the world. With tablets, teachers and students possess a mobile recording and editing device (text, photos, audio and video), publishing platform (blogs, wikis, video to YouTube, audio to SoundCloud, photos to Flickr), as well as social media access point (Twitter, Facebook, LinkedIn, newsreader apps). This mobile access extends the learning context beyond the walls of the classroom and the hours of the school day, while the instant access to content and social networks opens up avenues for communication and collaboration across distance and time. In this final piece in our Someday/Monday series, we take a peek into the future of richly collaborative classrooms and then give some advice on first steps towards getting there. In 2003, Ben Schneiderman published Leonardo’s Laptop, a book about human computer interaction. In the book, he proposed a simple framework for designing technology-mediated learning experiences: Collect, Relate, Create, Donate. In a typical technology-infused lesson or unit, students would access new information and skills (Collect) and then work together (Relate) to craft a multimedia performance of their understanding (Create). When finished, the work shouldn’t just sit on a teacher’s desk, but be shared widely, ideally with others who might genuinely benefit from the work (Donate). The connectivity of the Internet gives us the opportunity and responsibility to share what we are learning with others. While technologies have changed quite a bit over the last 10 years, the framework remains a helpful rubric for designing learning experiences. One common wrinkle with the Donate step in Schneiderman’s framework is that many teachers and students simply launch their products onto the Internet, and most of the time they land like a tree falling in an empty forest. In the best learning environments, sharing work doesn’t just mean posting on the Internet; it means building connections with a wider community, so that sharing becomes part of a set of relationships and patterns of exchange. 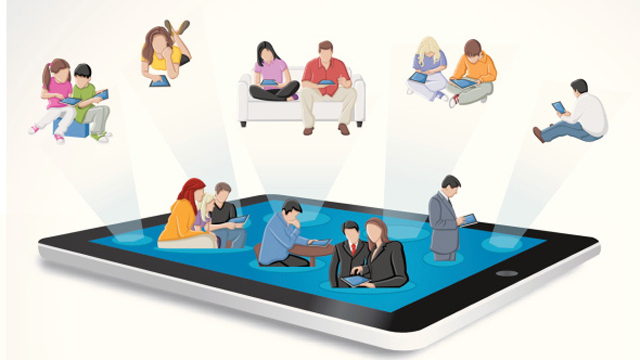 Mobile computing devices let students take those connections with them wherever they go. Imagine creating a learning context that spans countries or continents. Consider a learning environment where students run their own “class” outside of class time with peers, or even other teachers, and then come to school ready to take advantage of face-to-face opportunities. Used creatively, tablet computers can empower students to collaborate and share, to take more ownership of their learning, and to make deeper connections not only to the content, but also to their learning community. As Wideen’s blog shows, the technologies of connecting with others are relatively simple. Twitter is one of the best places to get started, and Mrs. Wideen’s classroom Twitter account (@MrsWideensClass) shows how a collaboratively produced stream of tweets from students can become a running record of classroom life through pictures, text, questions, and conversations. It also provides a mechanism for modeling the connections that we hope young students will make as they progress in their education. Another great way for classrooms to starting building connections is for teachers to lead by example, creating their own personal learning network using social media. Again, starting a Twitter account is easy, and there are plenty of educators looking to collaborate and connect with like-minded teachers. Last year, EdTechResearcher posted a pair of posts on Teaching Teachers to Tweet (Part I, Part II) that offer a good introduction to the topic, and Teaching Toddlers to Tweet on Edutopia provides examples for addressing the topic with even our youngest students. For synchronous conversation, Apple’s Facetime, Google’s Hangouts, and Skype are all suitable options for having video chats with other classrooms, experts, or interesting people. One recent trend combining technology and Social Studies has been “Mystery Skype,” where classrooms ask each other questions and then try to guess where the other classroom is. Skype in the Classroom has a good introductory blog post, and Holly Clark offers up 5 Amazing Ways to Collaborate with Another Class on Edudemic, and check out MindShift's 5 Ways to Inspire Students Through Global Collaboration. These kinds of simple exchanges can be great building blocks for future connections and collaborative projects. The greatest risk of our investment in tablet computers is that nothing will change. We could find in a few years that, at great expense, we’ve traded paper textbooks for digital textbooks, paper notebooks for digital notebooks, and paper multiple choice tests for digital multiple choice tests. We may find that as educators we simply take these expensive new devices and digitize existing practices. Our hope is that we can do more, that we can take the investment that the public is making into education technologies and use them to create much richer learning experiences for students. We’ve tried in these four posts about Consumption, Curation, Creation and Connection to chart a journey from the ordinary to the exceptional, and in each post we’ve tried to point the way to transformative uses of technology while helping point out the first step (Monday) of a longer adventure (Someday). Many thanks to all who have read, shared and commented on these posts over the last few months!